Shop at Connor via Shopcred and you can save money with our Connor deals, coupon codes and offers. Plus earn rewards on eligible purchases which are redeemable as cash and join our conversations. Shopcred is the modern place to Shop. Men's knitwear: a standout range that can not be missed. 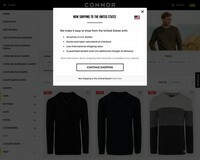 The Connor range includes v-neck jumpers and round neck sweaters. Made to keep you warm and look sharp. 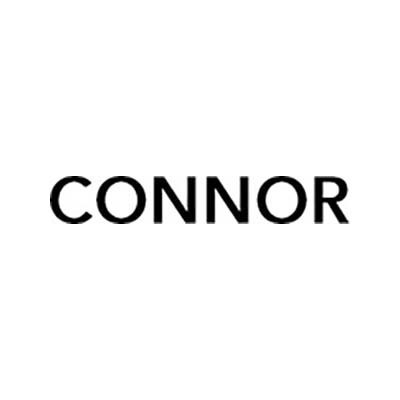 Connor delivers the latest fashion for men across Australia & New Zealand. Smart and casual across shirts, suits, tees, pants, shorts & more. Shop Online Now. 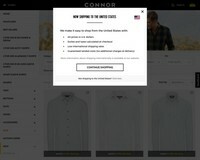 Connor Clothing are now offering 3 for $100 Long Sleeve Shirts for Men, more than 100 styles. Shop 2 for $100 on Men'ss Long Sleeve Shirts Online at Connor. Shop our latest arrivals in menswear and get 20% OFF for shirts, polos, pants, suits, shorts and more. Stand out from the crowd with Connor. 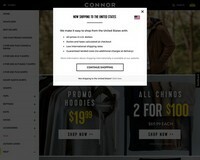 View top value deals on the latest fashion in menswear from Connor. Wide range offers Sale 30% OFF for shirts, tees, suits, pants and much more. 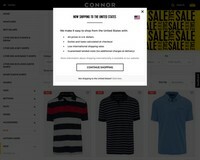 Connor Mens Clothing on Sale. T-shirts, Bottoms, Shirts, Polos, Shorts, Shoes and more on Sale, listed by category. Save on a range of select menswear. Top value deals on shirts are not to be missed. Buy 2 and get 1 FREE for Long Sleeves Shirts and Men's Shirt! Connor are giving up to 70% Off now on site across a large portion of their mens fashion. 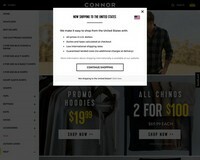 Use these working Connor coupons when you buy menswear clothings and accessories.Connor delivers to select countries. Connor opened its first store in 2006. To this day, it is one of the most reputable Australian menswear brands. 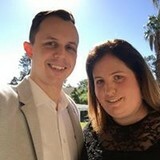 They have over 140 stores all over Australia and they pride themselves on offering great styles of men’s clothing, footwear, and accessories with great and competitive prices. They offer a wide range of styles which make their clothes easy to style, versatile and great for any occasions. Connor has a partnership with Borderfree which allows people from different countries to shop at their online stores. They offer free shipping for orders of $60 or more and they also have free returns to store and returns by posts, so you can choose which one works best for you.From their humble beginnings, now they are one of Australia’s trusted menswear brands. They come up with fresh styles for each season, making them a reliable clothing men’s shop. They also offer markdowns and discounts regularly. Step 2. In your bag, there is a promotion code field. Enter your promotion code and click apply. Step 3. Fill in necessary information and make sure the discount you are expecting is reflected. Different selections of men’s hoodies. Different selections of men’s chinos and denim. Different selections of men’s t-shirts. Different selections of men’s shorts. 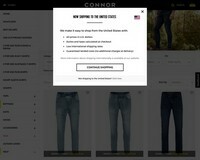 Connor offers free return of items to any of their stores in Australia. Item should be accompanied with receipts and it must be in original condition. You also have to option to ship it using the post office.